It's official: Crystal Cruises has the bravest crewmembers around. 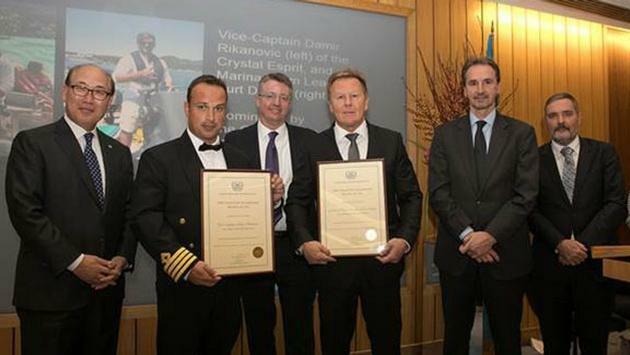 The International Maritime Organization (IMO) presented Certificates of Commendation to Vice Captain Damir Rikanovic and Marina Team Leader Kurt Dreyer of Crystal Cruises’ Crystal Esprit at the 2017 IMO Award for Exceptional Bravery at Sea November 27, 2017 in London, England. The awards were based on a Cruise Lines International Association (CLIA) nomination for the crew’s selfless assistance in saving 12 French nationals, (three children and nine adults). The endangered dozen were aboard a distressed catamaran in stormy conditions near the Seychelles on February 16, 2017. The IMO is a specialized agency of the United Nations charged with setting the standards for international shipping safety, security and environmental performance. Its annual IMO Award for Exceptional Bravery at Sea was introduced to recognize people who display courage by attempting to prevent marine environment damage or save lives at sea while risking their own. Currently, the Crystal Esprit is the only small ship operated by the Crystal Yacht Cruises brand. The next Crystal Endeavor mega yacht is scheduled to join now in 2019. It’s always wonderful to see policies placing safety first, but putting them into practice is more telling of a line’s core philosophy. 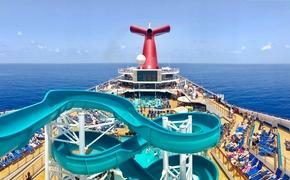 Crystal Cruises and parent company Genting Hong Kong should be very proud.